This week on WELSTech Martin, Sallie and Gail Potratz take a look at the components of a school technology plan. School Technology Plans – Martin and Sallie are joined by Gail Potratz, Technology Coordinator at Emanual Lutheran School in New London, WI and our semi-regular classroom technology correspondent, for a discussion of school technology plans. Why do schools need a tech plan, who should be involved in writing it and what should go into it are a few of the questions addressed. This week on WELSTech the conversation focuses on tech tips for effective ministry in a challenging economy and Martin and Sallie talk with Pastor Daron Lindemann about the new Message from the Master web site. 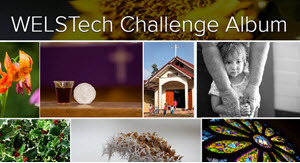 Technology in Tough Economic Times – Martin and Sallie share a host of ideas for wise use of technology in the church and school setting to save money. From reducing paper printing and distribution costs to prolonging the life of hardware, there are many ways to carry out effective ministry in times of economic challenge. Message from the Master (20:14) – Martin and Sallie talk with Pastor Daron Lindemann from Grace in Milwaukee, WI about his work on the Message from the Master project and their brand new web site. Pastor John Borgwardt from Risen Savior in Pooler, GA is looking for solutions for mass e-mail. Listen to WELSTech Episode 026 for ideas. This week on WELSTech the discussion topic is distributing ministry-related video via the web and Martin and Sallie share ideas and resources to help you get started. Streaming Video Ministry – Martin and Sallie discuss ways to expand your outreach using the power of the web and free video streaming sites. Both live and archived video can be included in your web site and be used to reach a variety of viewers with the gospel. Steve Brown from Messiah in South Windsor, CT and blogger at Worship Ideas You Can Use enjoyed episode 057 and wrote to share stats on how his self-publishing voice is reaching 98 countries! Congratulations Steve and keep up the great work! Laurie Esch Taylor from Grace in Yorba Linda, CA wrote to tell us how the idea of closed-captioning sermon videos, which we discussed in episode 055, was especially appealing to her because she has family members who are hearing impaired. Karen Zastrow from Zum Kripplein Christi in Iron Ridge, WI and blogger at Paper Delights had some nice things to say about WELSTech in a recent post. Thanks Karen! Episode 059 – We’ll discuss ways technology can assist ministry efforts in these tough economic times, and we talk with Pastor Daron Lindemann about the “Message from the Master” radio show and web site. This week on WELSTech Martin and Sallie discuss the effects on gospel outreach of the shift from traditional mass media to individual self-publication via the web. Are You a Media Outlet? – Continuing the discussion of Clay Shirky’s book, Here Comes Everybody – The Power of Organizing Without Organizations, Martin and Sallie look at chapter 3 and discuss the amateurization of mass media and the effect self-publishing is having on ministry. Looking for answers to questions of faith for personal growth and sharing the Word? Check out the WELS.net Topical Q&A. MLC student Jeffrey Clark sent in a request for an upcoming WELSTech episode – Libronix software tips and tricks. Check out details on the new addition of Christian Worship and Christian Worship Supplement lectionaries to Libronix – www.wels.net/jump/cwsupplement. The WELSTech listserve members have been sharing ideas about electronics recycling. We also heard from Cindy Krueger from Shepherd of the Hills in Lansing MI who shared a link to a new recycling program from Best Buy launching February 15th in all U.S. stores. Episode 058 – Martin shares highlights from his Mission and Ministry presentation on streaming video, and we talk with Pastor Daron Lindemann about the “Message from the Master” web site.